I feel like a goldfish staring up through aquarium water that hasn't been changed in a couple of months. That hazy-murky sky overhead is the result of smoke from wildfires raging out west. An "Air Quality Alert" is posted for roughly the western third of Minnesota for particle pollution that poses some risk to the elderly and people with heart or lung disease. We just get a taste of terrifying fires raging across California. In other news: Hurricane Maria's 2017 death toll in Puerto Rico is now over 1400, on a scale with Katrina in 2005, which claimed over 1,800 lives. Cooler water should mean fewer hurricanes in the Atlantic this year. Then again, it only takes one taking the wrong track. Dry (smoky) skies linger into Monday with a warming trend; daytime highs pushing 90F each day. Although the worst of the heat stays to our south I see a warm bias into late August. Climate Central reports mosquito season in Minnesota is 18 days longer now than 1970; a total of 130 days where disease transmission is possible. Gee thanks Paul! Avoid the skeeters and enjoy a lake-worthy weekend. Smoke Gets In My Eyes. Yesterday's midday GOES Geocolor visible image shows plumes of smoke from western (and Canadian) wildfires pushing across the Dakotas into Minnesota and Wisconsin. Poor Air Quality. Thursday's air quality report from the Minnesota Pollution Control Agency showed unhealthy air quality levels over parts of southwestern Minnesota (particle pollution); a direct result of western wildfires. Mosquito Risk Increasing With Warming Temperatures. A longer growing season sounds great. Mosquitoes tend to agree. Here's an excerpt from Climate Central: "...The number of days each year that are suitable for disease transmission by mosquitoes is rising in much of the U.S., as temperatures climb with climate change. This can increase the risk of mosquito-borne diseases such as Zika and West Nile. Following research from Stanford University, Climate Central analyzed the number of days in the spring, summer, and fall each year with an average temperature between 61°F and 93°F, which is the range for transmission of diseases spread by Aedes or Culex type mosquitoes. Of the 244 cities analyzed, 94 percent are seeing an increase in the number of these “disease danger days.” Reno leads the list of cities with additional disease danger days, averaging an additional 52 days per year in that temperature range compared to a half-century ago..."
Flashes of Heat. Although the epicenter of heat remains from the Plains into the western USA into the last week of August we'll probably see a few more 90s the latter half of this month. A real summer - imagine that. Who Experiences the Most Oppressive Heat? Factoring in duration of heat and humidity that honor goes to Louisiana and eastern Texas (hello Houston!) Check out the story at Forbes. Map courtesy of NOAA NCEI and Brian Brettschneider. Hurricane Forecasters Lower Atlantic Hurricane Season Prediction. Then again, all it takes is one. The water is just too cool for sustained hurricane formation, according to NOAA: "Conditions in the ocean and the atmosphere are conspiring to produce a less active Atlantic hurricane season than initially predicted in May, though NOAA and FEMA are raising caution as the season enters its peak months. “There are still more storms to come – the hurricane season is far from being over. We urge continued preparedness and vigilance,” said Gerry Bell, Ph.D., lead seasonal hurricane forecaster at NOAA’s Climate Prediction Center. Seasonal forecasters with NOAA’s Climate Prediction Center have increased the likelihood of a below-normal Atlantic hurricane season to 60 percent (up from 25 percent in May) in the updated outlook, issued today. The likelihood of a near-normal season is now at 30 percent, and the chance of an above-normal season has dropped from 35 percent to 10 percent..."
Tropical Summary. Unusually cool water is putting a lid on tropical activity in the Atlantic basin, but a warm Pacific is spinning up numerous storms so far this hurricane season. Map: AerisWeather and Praedictix. Tornadoes on the East Coast May Be a Sign of Things to Come. The correlation between a warming climate and tornado frequency/intensity is still largely unproven, but patterns are shifting - there's little doubt about that. Here's a clip from a New York Times story: "...The storms were far from the region in the middle of the country known as Tornado Alley, where the bulk of the nation’s tornadoes occur. In a summer already marked by simmering heat that researchers have linked to global warming, is climate change also making tornadoes more common in places where they once were infrequent? Though individual weather events are distinct from the more broadly changing climate, global warming does influence weather patterns. Still, any link between climate change and the frequency of tornadoes is far from straightforward, according to researchers..."
Photo credit: "Debris cluttered Betty and Tom Therrien’s yard after a tornado swept through the area near Douglas, Mass., last month." CreditChristine Peterson/Worcester Telegram & Gazette, via Associated Press. California's Viral Fire Tornado Has Scientists Searching for Answers. Earther at Gizmodo has a particularly good explainer: "...A fire tornado shares some features with a fire whirl but quite literally takes things to new heights. These rotating columns of air are, by definition, connected both to a cloud system above and the ground below. So-called pyrocumulous clouds (and pyrocumulonimbus thunderclouds) form as hot air rises above a wildfire’s smoke plume, cools, and condenses, creating the potential for a tornado to form. But these clouds typically only emerge at high altitudes due to the intense heat of the flames. What that means is that any vortex connected to both a fire-generated cloud system and the ground is going to be big. According to Clements, the one that formed inside the Carr Fire on the evening of July 26 was associated with a pyrocumulonimbus system that extended tens of thousands of feet up into the stratosphere..."
Photo credit: "The aftermath of the Carr Fire tornado." Photo: Craig Clements / Fire Weather Research Laboratory. Invasive Algae Found in West Metro Lake. 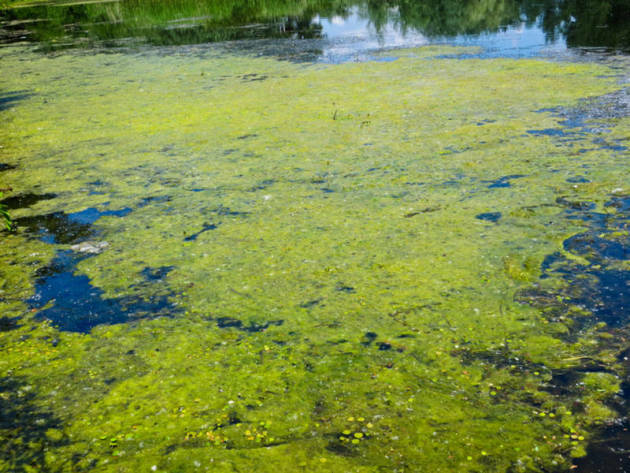 Here's an excerpt of a post at Patch.com: "The Minnesota Department of Natural Resources has confirmed the invasive algae starry stonewort in Hennepin County's Medicine Lake. This is the first new confirmation of starry stonewort in Minnesota in 2018. There are now 12 lakes in Minnesota where starry stonewort has been confirmed. A DNR-trained Three Rivers Park District watercraft inspector recognized starry stonewort on a boat propeller and notified the DNR… Starry stonewort has never been eradicated from any U.S. lake, but treatment can help reduce the risk of spread and provide nuisance relief for water-related recreational activities..."
The Era of Megafires: the Crisis Facing California and What Will Happen Next. The Guardian has perspective on the record fires gripping California and much of the western USA: "California is no stranger to fire. The temperate winters and reliably dry summers that make the Golden state such an attractive place to live are the same conditions that make this region among the most flammable places on Earth. But even for a region accustomed to fire, the continuing wildfire siege has proven unprecedented. Although it is only early August, numerous very large, fast-moving, and exceptionally intense fires have already burned vast swaths of land throughout the state – consuming hundreds of thousands of acres and thousands of homes and claiming at least nine lives, including four firefighters. State and national firefighting resources are stretched to their limits; choking smoke inundated the state capital of Sacramento; and much of Yosemite national park is closed indefinitely..."
Nicest Weather in America? We can debate this until the cows come home. Yes, it's subjective. Many Minnesotans fervently believe that 30F with fresh snow and light winds is "nice weather". Who am I to disagree? Brian Brettschneider, a climate scientist based in Anchorage, wrote a fascinating story at Capital Weather Gang: "...While it’s admittedly hard for even two people to agree on what ideal weather is, we’ve made an attempt to set up some goal posts and determine what parts of the United States have the most days with nice weather and which have the least. The criteria we used make the assumption that people prefer days with moderately warm temperatures, at least partial sunshine, a light breeze, low humidity and no precipitation. In other words, we’re highlighting comfortable days that don’t require a jacket, when you don’t feel like you’re stepping into a sauna, and when you won’t get poured on or blown away..."
Nice Weather Index. Not surprisingly, the far west and southeast scored best (if you like it mild, sunny and dry, with light winds). Map credit: Brian Brettschneider. 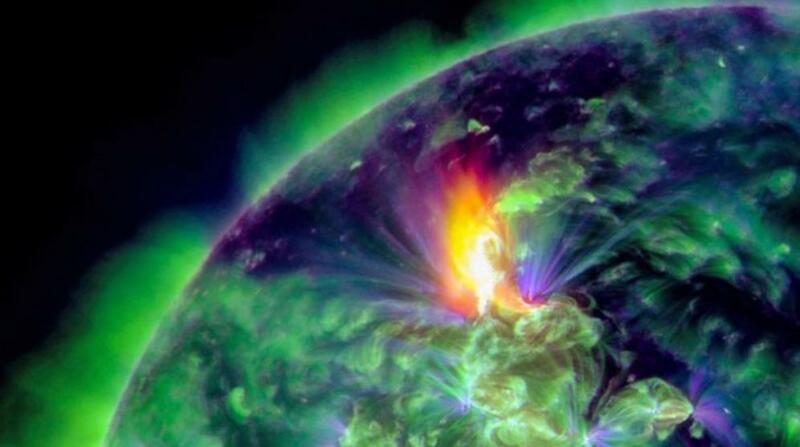 NASA Launching a Craft to the Sun. Slashdot.org has an update: "In T-minus three days, NASA will launch a car-sized spacecraft to investigate our Sun's scorching hot atmosphere. "The vehicle is the Parker Solar Probe, and it's set to launch at 3:33AM ET on Saturday, August 11th, from Cape Canaveral, Florida. "It'll be riding on a Delta IV Heavy rocket made by the United Launch Alliance, which will send the probe zooming toward the inner Solar System," reports The Verge. "Just six weeks after launch, Parker will do a flyby of Venus to alter its route slightly, and then six weeks later, the vehicle will be in the corona. Over the course of seven years, Parker will do 24 orbits around the star, as well as six more Venus flybys so that it can get even closer to the Sun's surface over time..."
File image: NASA SDO, GOES-15. Autonomous Sailing Drones Help Researchers Forecast Extreme Weather. A story at CNBC.com caught my eye: "Oceanic researchers are turning to autonomous sea drones to help them forecast extreme weather and understand the world's changing weather patterns. 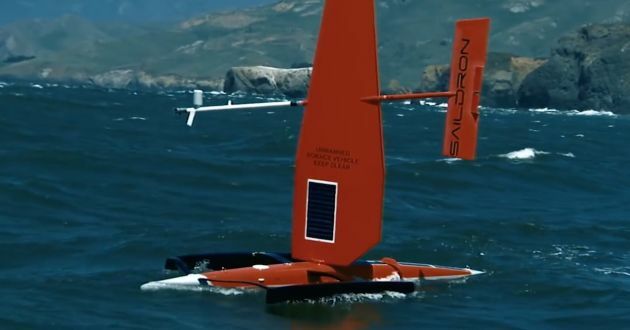 The 23-foot-long drones are made by Bay Area start-up Saildrone. Each Saildrone can be outfitted with a number of different sensors that it uses to gather and transmit real-time measurements on metrics including temperature, wind, humidity, solar radiation and weather patterns. The National Oceanic and Atmospheric Administration is gathering data from two Saildrones that are heading back to California from a voyage across the Pacific Ocean. The goal is to measure the accuracy of the data compared with conventional methods..."
World's Biggest Oil Exporter is Betting $2 Billion on Electric Cars. Smart to hedge your bets. Here's an excerpt of a post at ThinkProgress: "...The Financial Times reported Tuesday that Saudi Arabia has acquired an “undisclosed stake of between 3 and 5 per cent of Tesla’s shares this year.” The position is worth some $2 to $3 billion, making the Saudis “one of Tesla’s largest shareholders.” In other words, the world’s biggest oil exporter — whose entire economy is built around more than $100 billion in oil and oil-related exports a year — has placed a massive bet on the company whose entire goal is transitioning the world off of oil. The investment came from Saudi Arabia’s $230 Public Investment Fund (PIF), which is the Saudi’s “sovereign wealth fund” — a state-owned investment vehicle..."
Pressure to Work in Pain. A Quarter of Massachusetts Construction Deaths Are in Construction. A story at The Boston Globe caught my eye: "Relying on skill and strength to raise up skyscrapers and spruce up homes, construction workers routinely face difficult and dangerous working conditions. 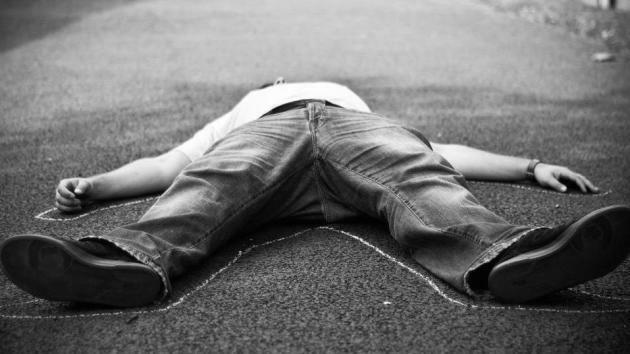 Now a Massachusetts study has identified an overlooked hazard linked to their jobs: fatal opioid overdoses. The report by the Massachusetts Department of Public Health found that nearly a quarter of overdose deaths in a five-year period occurred among people, mostly men, who work in construction. Farmers and fishermen also had higher-than-average rates of overdose deaths. The common factor: Workplace injuries occur frequently in these occupations..."
Image credit: "Stress makes us more susceptible to rage." BEN SMITH/FLICKR/CC 2.0. People Tend to Date People "Out of Their League". No kidding. The Boston Globe explains: "Online daters tend to pursue people who are “out of their league,” according to a new study that used a unique method to analyze a large online dating website in Boston and three other major US cities. The study determined people’s “desirability” by using the PageRank algorithm, which was created by the founders of Google to rank Web pages. The study found that men and women both pursued partners who were about 25 percent more desirable than they themselves were. And they tended to write longer messages the more desirable the person they were writing to..."
The Business of Too Much TV. What is "Peak TV"? Check out a post at Vulture: "...This is Peak TV. Not since the early 1980s — when cable became a serious challenger to the decades-old hegemony of Big Three broadcasters ABC, CBS, and NBC — has the television industry experienced such rapid growth: Between 2009 and 2015, the number of scripted shows nearly doubled, from just over 200 to an estimated 409 last year. Netflix alone says it will produce 600 hours of original television and spend $5 billion on programming, including acquisitions. This dramatic surge in TV production has touched nearly every aspect of the industry, from actors and showrunners to those responsible for production logistics for all of the new programming ordered from an ever-expanding roster of networks..."
15 days at or above 90F in the Twin Cities so far in 2018 (average for the year is 13). 90 F. high in the Twin Cities Thursday. 82 F. average high on August 9. 71 F. high on August 9, 2017. August 10, 2004: Cool Canadian air is ushered in on strong northwest winds. International Falls has its record coldest high temperature for this date with 49 degrees. The Twin Cities only saw a high of 59. August 10, 1939: Very heavy rain falls at Two Harbors, accumulating to 5.2 inches of rain. San Diego Scientists Say Extreme Events Caused by Climate Change Could Spur Action. Check out a story at KPBS.com: "If people in wealthy nations start to realize that the fires, flooding, droughts and heatwaves surrounding them are due to climate change, will they take action? That’s the hope of two UC San Diego scientists who co-authored an article in "Foreign Affairs" magazine along with three members of the Pontifical Academy of Sciences and Social Sciences. The authors propose that as the rich nations of the earth see a greater impact from a changing climate world leaders will increase their efforts to limit carbon emissions and create technology that could remove carbon dioxide from the atmosphere. It is a hopeful message, coming at a time of great concern about our ability to avert a growing environmental catastrophe..."
Photo credit: Rich Pedroncelli / Associated Press. "Flames from a wildfire burn Monday, Oct. 9, 2017, in Napa, Calif. The fire is one of several burning across Northern California's wine country." Limiting Warming By Half a Degree Could Help with Extreme Weather. More perspective from a post at Newsweek.com: "...Scientists from the Chinese Academy of Sciences studied how the weather may change if humans are able to limit climate change. Published in Nature Communications, the study found that by changing the goal from 2 degrees to 1.5 degrees Celsius could prevent extreme precipitation events, such as abnormally high rain or snow that can lead to severe flooding, landslides and debris flows. "As the climate warms, both the mean state and the variability of extreme precipitation are projected to increase, inducing more intense and dangerous extreme events," Tianjun Zhou, an author on the paper, said in a press release..."
Tipping Point in Public Opinion? According to polling conducted by the Yale Program on Climate Change Communication 68% of Americans now favor a revenue-neutral tax on carbon. Incidently, so do many of the world's largest oil producers, including ExxonMobil. Costs of Extreme Heat are Huge, But Hard to Quantify. Here's a clip from a post at Climate Liability News: "...In terms of costs, heat-related climate impacts are likely to be in the billions of dollars, considering risks to health and mortality, economic disruption, and cooling expenses. Currently these costs are shouldered solely by taxpayers, but the climate liability lawsuits targeting the fossil fuel industry are trying to shift that burden. New York quantified its costs in its complaint against five major oil companies—recently dismissed by a federal judge but the city says it will appeal—as it faces skyrocketing costs related to heat. “Heat kills more New Yorkers than any other natural hazard and disproportionately impacts communities of color and the elderly, which is why the City is tackling this challenge with unprecedented investments in heat mitigation and adaptation programs,” said Jainey Bavishi, director of the Mayor’s Office of Recovery and Resiliency..."
File photo: Tom Wang, Bismarck Tribune. Europe's Heat Wave Shows How Climate Change Could Change Tourism. The time to hit Italy and Spain may be April and October vs. August. Here's an excerpt from NBC News: "...Climate change is going to have an impact, but it's not going to be a doomsday impact," said Michigan State University professor Michelle Rutty, who has researched the implications of warmer temperatures on tourism in Europe and the Caribbean. She predicted "shifts rather than outright declines" as tourists try to avoid scorching weather. "If you think of a place like Greece, there may be a shift in time when people travel to these destinations," Rutty added. "They won't want to go in August but now perhaps they'll go in the fall instead..."
How Geoengineering Could Mess Up Crops: Headlines and links via Climate Nexus: "Using techniques to block out the sun to slow global warming could have unintended side effects on agriculture, new research suggests. A study published Wednesday in Nature looks at how two recent massive volcanic eruptions--1982's El Chichón eruption in Mexico and the 1991 eruption of Mount Pinatubo in the Philippines--affected food crops in surrounding regions. The eruptions released massive amounts of sulphur into the atmosphere, blocking out sunlight and reducing yields of corn, wheat, rice, and soy by up to 9 percent. Researchers suggest that purposely employing similar tactics in geoengineering to cool the planet could negate any benefits of lowering heat stress on agriculture. "If we think of geoengineering as an experimental surgery, our findings suggest that the side effects of the treatment are just as bad as the original disease," co-author Jonathan Proctor said on a press call." (Washington Post $, Wired, Reuters, Earther, Vox, Mashable, CBC). Climate Change is Making Wildfires More Extreme. Here's How. Here's an excerpt of a video and post at PBS NewsHour: "...Yes, so we’re not saying that climate change is literally causing the events to occur. What we can conclude with a great deal of confidence now is that climate change is making these events more extreme. And it’s not rocket science. You warm up the atmosphere, it is going to hold more moisture, you get larger flooding events, you get more rainfall. You warm the planet, you’re going to get more frequent and intense heat waves. You warm the soils, you dry them out, you get worst drought. You bring all that together, and those are all the ingredients for unprecedented wildfires..."
File image: "In this Sunday, Aug. 5, 2018, file photo, a helicopter drops water on a burning hillside during the Ranch Fire in Clearlake Oaks, Calif. Authorities say a rapidly expanding Northern California wildfire burning over an area the size of Los Angeles has become the state's largest blaze in recorded history. It's the second year in a row that California has recorded the state's largest wildfire." (Josh Edelson, File/AP). To Get People Talking About Climate Change, Publish Your Study During a Hot Summer. Because we are wired to react to weather, not climate. Even though a warming climate is amping up extreme weather. A story at Quartz explains: "...The risks of climate change have been clear to us since at least the 1980s, and the predictions of environmental destruction to hit Earth have mostly gotten worse. That said, there’s still a sizeable population on the planet that doesn’t care about climate change or, worse, denies it’s real. To turn those people around, some of the world’s most preeminent scientists have figured out it makes sense to publish global-warming studies when it’s hot outside...Science is supposed to present reality as it exists. And, yet, what Hansen understood back then is that context matters as much as logical arguments. Weather is a localized phenomenon to which long-term climate trends contribute. One hot summer doesn’t prove that global warming is here—but it opens people up to having a conversation about the possibility..."